Gochu, meaning pepper in Korean, is one of the most popular fresh hot peppers found in Korean markets or at home gardens. 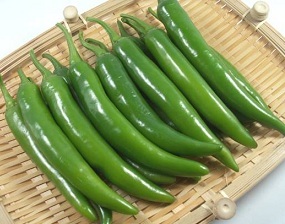 Fresh green peppers, 5-6 inches in length and half an inch in diameter with medium thick skin are mildly hot and well flavored, enjoyed by spicy food lovers worldwide. If enjoyed solely by itself, gochujang, dwenjang and and/or ssamjang can be used as its dipping sauce. Depending on the meal, sliced pieces of gochu can also be included in ssam to wrap cooked meat along with other side dishes.